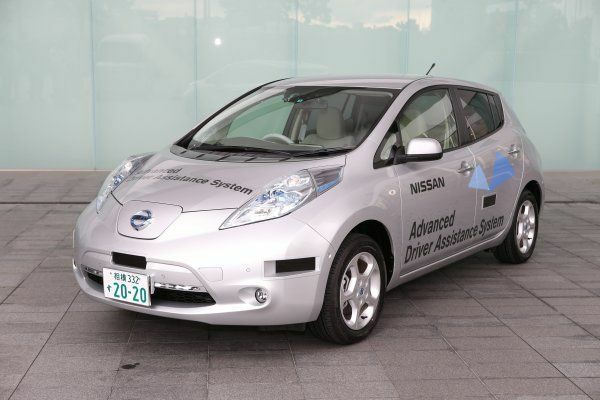 The first self-driving Nissan LEAF with the Highly Advanced Driver Assist System gets licensed for public road testing in Japan. Nissan wants its Autonomous Drive vision to come to fruition by 2020 and a big step towards making that happen is real-world field testing. The company received a license plate and provision to test their self-driving LEAF on public roads in Japan. The license plate includes the number 2020 to denote Nissan's goal. "This is an ordinary license plate for an extraordinary vehicle," said Nissan president and CEO Carlos Ghosn. "A month ago we revealed to the world our 2020 Autonomous Drive target. Road testing of the underlying technologies is critical to maintaining our leadership position and we are grateful to the Government of Japan for its support." Two of the key pillars of Nissan's vehicle technology strategy are zero fatalities in accidents involving Nissan vehicles and zero emissions. Autonomous Drive is an extension of the Safety Shield and 360-degree view systems currently available in the Nissan LEAF. Further, Nissan is currently constructing a proving ground in Oppama, Japan which will be dedicated solely to Autonomous Drive testing.